My first “encounter” with Belfast’s Titanic Museum took place, oddly enough, in a bar in Quito, Ecuador. My wife and I were sitting in a small lounge in the Plaza Grande Hotel, sipping and chatting with a family from Belfast. 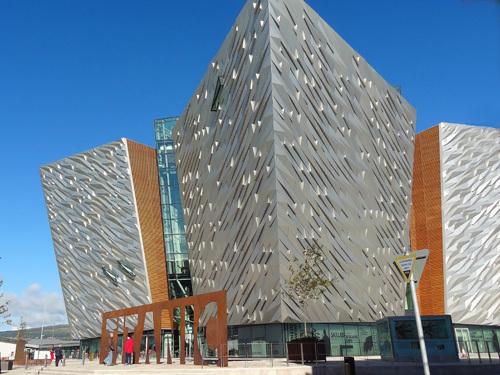 I had been to Ireland many times, but never to the North, and I asked them about the just-opened Titanic Museum. I remembered his wit when I visited Belfast five months later, with the museum at the top of my must-see list. I didn’t know what to expect since I hadn’t read much about it, but I was stunned both by the design of the building and the design of the exhibit inside. I’ve never been so mesmerized by an exhibition of this type. 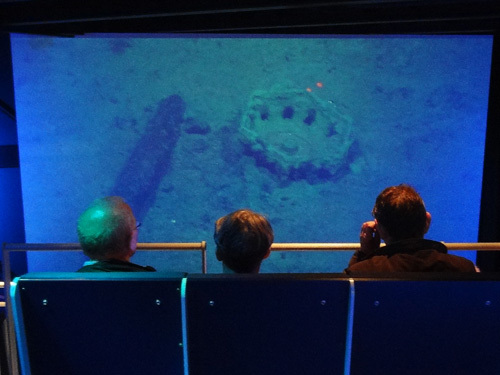 The exhibit takes you from the conception of the ship right through to its final resting place on the floor of the North Atlantic. It’s a world-class exhibit well worth the price of admission and, possibly for many, the cost to get to Belfast, as well. When I first approached the Museum it looked like some piece of modern art with huge pieces of steel jutting out from a glass core. I later realized that the four masses of steel each replicate the bow of the Titanic, and at 90 feet tall they’re the same height of its hull from keel to deck. It’s covered with 3000 silver anodized aluminum sheets, which were designed by the architects to reflect the water from pools at the base of the building, giving the illusion of waves around the hull. Stand outside looking at the building and you also see that the Titanic sign in front of the building is titanic as well. Much like the steel on the ship itself, it’s cut from a plate almost an inch thick and weighs 16 tons, the same as Titanic’s forward anchor. I found more surprises inside. As a walked into the atrium I was amazed by the industrial feel of the place, until I realized after a minute or two that it replicated the feel of the shipyard, with roughhewn wood beams and steel all about. The 60-foot high wall of the 20,000 ft.² space was covered with metal panels similar to those used on Titanic’s hull. Even the ticket desks were shaped like large portholes. 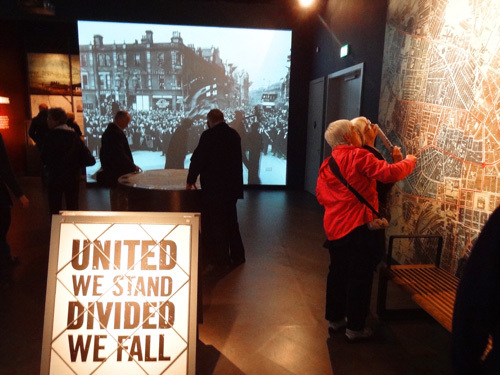 Once in the museum you walk through nine different galleries, each depicting a different phase of Titanic’s life. The first, fascinating in itself, shows life and working conditions in Belfast 100 years ago as plans were being made to build the ship. From there you go on to the Arrol Gantry and shipyard ride in the second gallery. En route you get the feel for the shipyard or, at least, as much as one can get in a museum, as you walk by steel plates, ladders leaning against the hull, etc. The shipyard ride, in cars holding six people, flies you through different facets of the building of the ship, winding among steel beams and plates, with the sounds of hammering and riveting all about as black-and-white photos and video recreations take you back in time. It’s all done very well. The launch of the ship in gallery three, seen on a large television monitor positioned over a great pile of huge anchor chain, follows the shipyard adventure. I was captivated by the old movie footage of the launch, as were others, and we watched the workmen in the lower right who looked as small as ants next to the giant hull. With the exception of the ride in gallery two, you move through it all at your own pace, and many of us stayed and watched the launch several times. You can see a one-minute video of Titanic’s launch by clicking here. 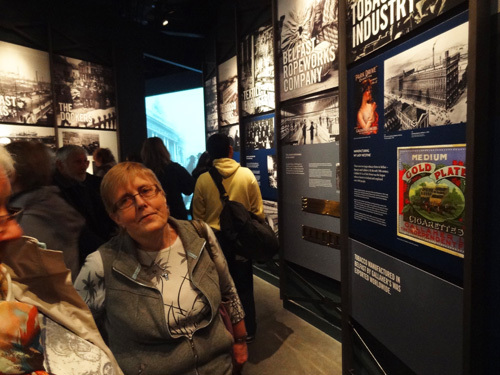 The fourth gallery depicted and explained the fitting out of the ship from the engine room right up to the first class cabins, while gallery five drew lot of interest with its movie footage of people boarding for the maiden voyage and the great sendoff of the ship from Southampton. 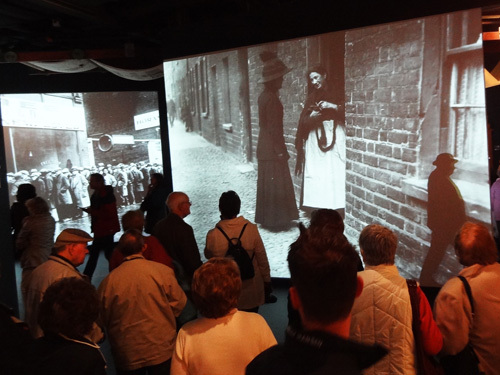 Gallery four also captivates people with its superb video production, a 270° panorama of the interior of the Titanic that takes you from the keel of the ship and the engine room, right up deck-by-deck to the bridge. It’s a view of the ship never seen before and if you’ve ever wondered what Titanic’s luxurious first-class staterooms looked like, this is the place to linger. 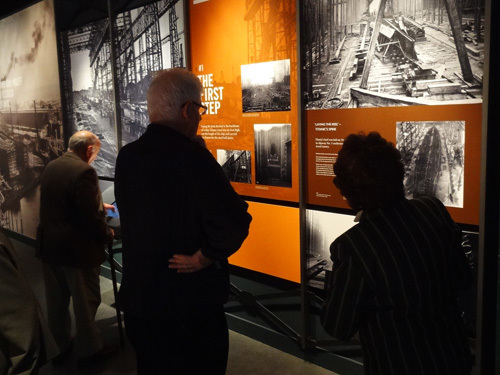 The next two galleries, six and seven, depict the sinking of the liner and the aftermath of it as news of the tragedy spread around the world. From our present-day perch in a high-tech world of TV and Internet, it was fascinating to watch news of the disaster slowly unfold day-by-day on front pages around the world. For me, though, one of the most interesting galleries was gallery eight. 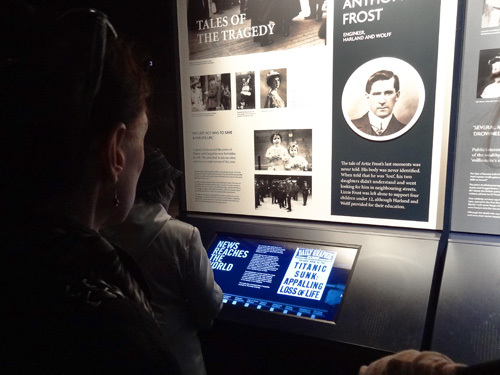 In addition to the exhibits on the walls that showed the many movies and books that proliferated from the tragedy, there were touchscreen computers that presented many of the myths and legends of the great liner, and separated fact from fiction. Much that I read surprised me. 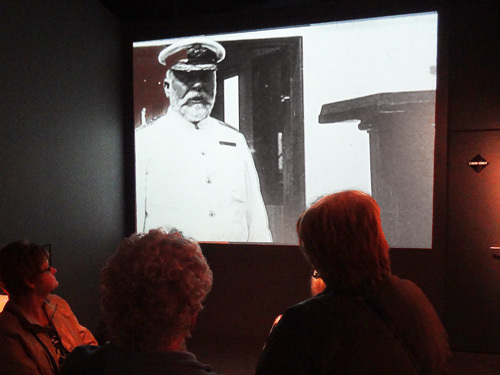 The exhibit draws to an end in gallery nine as you take a journey to the bottom of the North Atlantic with Dr. Robert Ballard who discovered the Titanic in 1985. It’s a most interesting exhibit since it has exclusive footage never seen elsewhere. 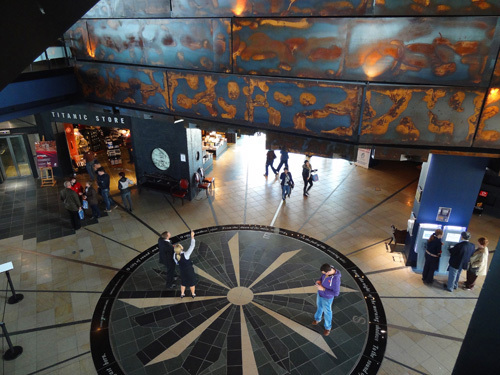 Outside of the museum, but close by, are several other sites related to the Titanic and well worth visiting. The slipway of the ship is to the left of the museum, and the office of Harland & Wolff, the ship’s designers, is to the right (it’s now undergoing renovation, however). The SS Nomadic, the tender that served the ship in Cherbourg, is a minute’s walk away (with an effort underway to find more funds for restoration) and Titanic’s dry dock and pump-house, is just a five-minute walk from Titanic Belfast. 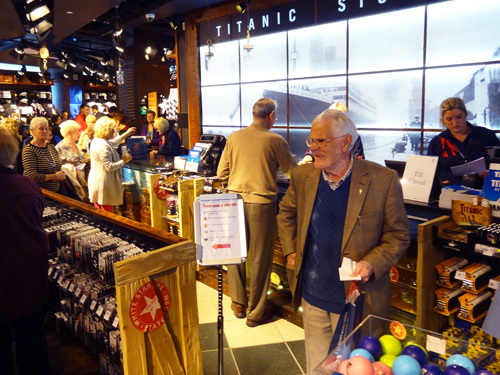 But what lures many people after their tour through the galleries is the Titanic Store. It’s likely one of the busiest museum shops in all of Europe, if not the world.